There is something about being a normal person that’s comforting. I know that, because apart from living frugally in the Caribbean as a self-employed dilettante, I’m a quite normal person, enjoying quite normal things. Okay, I’m no television and football fan, like most males in my age, and I hate cars. But I enjoy Hollywood cinema and cold beer, so there you have it. We’re all normal (as we’re all weird), to a certain extent. The comforting thing about normality is this: If you are normal and enjoy normal things, you don’t stand out. You don’t have to worry, you don’t have to care. You don’t have to demonstrate against the government, because you like the normal way things are going. You don’t have to eat healthier, because you’re okay with having a normal figure and a normal life expectancy. You don’t have to kill yourself at work, because you come along with a normal paycheck, and you’re happy with your children going to a normal school. The problem is that normality can also be a comforting way of ignoring our problems and making them worse. It can become normal to see your uncle drink half a bottle of whisky each day, but in reality, he is becoming an alcoholic. It can become normal to read that each year there are less albacore tunas caught in the Mediterranean sea, but in reality, we are extinguishing them. 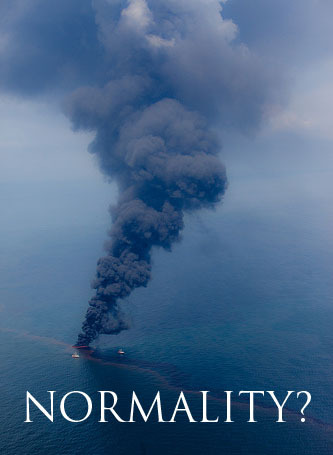 It could even become normal to see BP destroy our oceans because of unbelievable greed, but in reality, it’s not. It’s doing the wrong thing – and it’s us who are doing it, it’s us who are responsible, because we are living a lifestyle of unsustainability that has become our current normality. Alcoholics, extinction of species, and the pollution of our planet caused by our addiciton to oil may be as normal as underarm hair. But just because it’s “normal”, we don’t have to accept it. If things were different, why would we shave our armpits? Why would we invent pain killers, if pain is something completely normal? Why bother about using condoms, if AIDS is normal? Normality doesn’t exist. It’s always a question of our point of view and our interpretation of reality. Whatever we are doing (or not doing) that feels wrong, we are free to change it at any moment of our lives – even if it appears to be normal. We may as well start here and now. Illustration based on a photo (cc) by kk+. Thanks for your comment, Jonathan! Change is here, every day, so let’s try to steer it towards a brighter side! Agree absolutely, we’re all normal and we’re all weird. There’s a different however on what is common and what is normal, or should be the norm. Absolutely. But common sense makes your should sound right on. Anyway, big ideas are hard to make concrete and is true, we definitely can’t impose our beliefs. We each have to decide what is normal to us, with the understanding that even our sense of normality is going to change over time. But beyond ourselves, the word normality loses its meaning and I agree with you that it can’t exist. I try to have zero expectations as much as possible, and I constantly try to remind myself that anything that appears even remotely normal to me, will most likely not be the case for anyone else. With this method, I can safely navigate through life (most of the time), no matter what changes occur. It’s like living on the outer edge, where you get such a broad view of everything, that no one aspect can be considered normal. And thanks for the link to the Armpit Shaving post! As for “living on the outer edge”… this sentence opens a world of images in my mind, mostly of navigators on a still undiscovered planet – they indeed get a broad view of everything and their notions of normality challenged. And this spirit is still alive today, I think! Thanks for stopping by, Earl! as a struggling wannabe vegetarian (meaning dammit, i’m trying and it’s hard, and i ate some fish), i know all about this. well, i remember watching something about it on tv, like the discovery channel or something cool like that. how commodities like sushi are making demand for albacore tuna and depleting the resource. because that’s what we do. take too much. always. i don’t like normalcy. it’s status quo. and so, i’m rather starting to accept the fact that i’m a little bit “crazy”. That’s the spirit, Janet: A big YAY for craziness, and good luck for your journey toward vegetarianism. I don’t eat a lot of meat or fish, maybe once every ten days or so, but then try to get the best quality available. I personally really like the taste, but eating cheap (and often ugly) meat every day isn’t my thing, and it’s not sustainable either, as the tunas show. I linked here from Penelope’s last post while looking for blogs similar to mine and this blog is great. You got a new follower. My thoughts are yes, normality doesn’t exist within any individual but as a more collective, societal, meta-thought, either formed by the behavior and thoughts of everybody with a social context, or by a group of people in power, it has to exist or we wouldn’t be writing about it. Or am I completely missing the point. Either way, great post! Thanks Mark! I suppose to see normality as a kind of “meta-thought” influenced by different forces in society makes a lot of sense. This is exactly the reason why we shouldn’t take it for granted, but look behind it and think for ourselves. I have to disagree with you on one point. I believe that normality exist. To me, and depending on the topic, normality is the higher percentage of the opinions, decisions, experiences, etc. from individuals all together. It’s definitly based on the average of the these things. I believe that a persons perspective of normality can drastically differ from others. However, I agree that people have the ability to change their reality from normal to unique. Thanks for your comment, Kortni. You’re right of course that normality exists in our perception of things. It’s exactly what you describe, “the higher percentage of the opinions, decisions, experiences”, “the average”.